It was not a classic speaker – audience session. The audience were parted into 3 groups. Every group got a question to discuss it on the flip chart. #2 What do I know about HANA? #3 What will I do if my company will implement HANA? The results were discussed all together and I wondered about some questions and the nescience. Now I’m familiar with the technical topic HANA since the last 3 years. I’m administrating oracle databases since 9i – so I know both databases pretty good. But I was shocked that since HANA was released in 2010/2011 (“SanssouciDB”) the people know so less about whole truth. 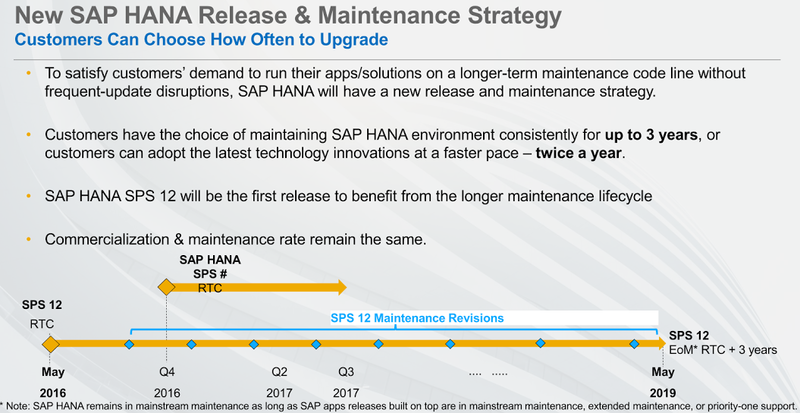 Although the last 2-3 years SAP talked about nothing else more than HANA. Support: OSS + metalink => future? Only OSS? Oracle tools (RMAN/Dataguard/brtools/Grid) => counterparts with HDB? I will point out in this blog the questions maintenance strategy. Not the normal details which we can all find by our self via google, sap.help.com and the notes. I will just highlight and critical scrutinize the current strategy. Most of the systems which I have administrated could only be maintained with a new patchset once a year, because the testing effort for the application teams are too long to update/upgrade the system, activate new features and verify the functionality. You have to block this people for a long period besides their normal business tasks + projects. Now you get only 9-months support for your revision. Ok 9 months are short but maybe ok for the most companies. But wait a minute – you have to wait until the DSP is released to test and verify it for your productive system. So this are 6 months minus testing maybe 4-5months. The technical part is pretty easy but the application team are testing the whole year – nothing else! Ok now we shift some application logic from the ABAP application server with CDS (Core Data Services) down to the database. So I have also the responsibility to do regression tests! After the 3months maintenance revision period, you have to update the system to a newer SPS because no more fixes will be available for it. So if you have an issue there will be no downport to this revision after this period of time, anxious or? New innovative applications benefit the most from the new SAP HANA functionalities that are delivered through SPSs . S/4 HANA customers also should consider adopting the most recent SAP HANA release as new S/4HANA capabilities are often powered by the newest SAP HANA innovations. – From the date I passed the exam? For C_HANA_TEC_11 you have to pass C_HANA_TEC_10. So when the exam is available it is possible that one or two newer SPS were released in the meantime. This results in a certificate which is only valid for 6-12 months! How many certifications have you passed for oracle, db2, mssql, maxdb or Sybase? I think max. two – if any. However, but not every year! To install a productive HANA DB you have to be certified. What is your experience and strategy with HANA and the other “any DBs”? great blog post. So the basic statement about SAP HANA is “After the patch is before the patch”. The customers must have a real obsession about patching, if they accept this kind of product life cycle. Just a little intellectual game by adopting this approach to Oracle. So you would have a patch set (let’s call it) 11.2.0.2, but this patch set is only valid for 6 months and you would only get support and patches for this patch set for 9 months in sum (so basically 3 PSUs / SBPs). That’s ridiculous compared to the current available RDBMS life cycle of Oracle (e.g. MOS ID #742060.1). the question is moreover, what is the process to get a patch. – Can I patch my db without having a supportwindow/downtime? – What do I need to test/validate/do before patching? – How is the backup-strategy in case something went wrong? How much do I have to pay for a patch all cost included? These are just a few questions missing to draw a big picture. If this is less or at least the same cost where is the problem. And having a certificationupdate every 18 Month isn’t that bad, is it? I would love to stay always “up-to-date” with new features if this doesn’t end in a massive invest-problem for my company. – Where do you got your digits for testing approved. Do you run a S/4 System in productive use right now and have done there severel upgrades? Upgrades without upgrades of the application-side doesn’t have a deep impact on the testing is my experience, so I wonder that you have such a hugh digit. > Upgrades without upgrades of the application-side doesn’t have a deep impact on the testing is my experience, so I wonder that you have such a hugh digit. As far as i can see you are a developer and so you might be right in case of application adaptation. However look at this topic from an operational perspective. Would you like to run your critical SAP system (well SAP claims that HANA is already mission critical ready) in a non tested environment? Just to mention a few key points from an operational perspective like Backup/Recovery, HA (system replication), etc. In addition you always have to do some performance regression tests, unless the database vendor guarantees that no change in behavior is included in a patch set. For example Oracle is doing this with its PSUs (quarterly patches) – it only includes security and wrong result set fixes, but it does not change the optimizer, etc.. However if you install a whole patch set (e.g. like 11.2.0.2, 11.2.0.3, etc.) then you have to do the whole test cycle to validate performance. Customers are very critical in this point at least when the performance dropped drastically the first time after a patch set apply. However as SAP HANA develops so quickly – SAP also works on optimizations and transformations, etc. all the time with each SPS. So no guarantee here. yes, I’m a developer 😛 and yes of course, I’m not standing that hard at a point that everything is fine and noone has to worry, but exact this point is one of the biggest points customers was waiting for. That new technologies and possibilities are having an impact on the business. This will be just possible if the upgrades aren’t years away. As a developer I also worry today, that I have such a lot of different systems with different releases and I can’t use everything I want to use (for example ADT-Tools). I can understand that there are some other pain-points on the operational perspective which I can’t cover or even imagine, but I’m a first row soldier also on listen to the customers need and also I see how SAP runs his systems in the cloud and if I’m right, the cloud-operational side is covered by SAP and one of the major points to move there is that the upgrades will be there delivered in this short time. That brings me to the question, if this is really that much testing and out of that this big impact how is SAP doing the upgrades? They even can’t know every single custom-developed application, even if they want to it wouldn’t be possible (and I’m pretty sure they also can’t test every application of their own without automation). I’m pretty sure, SAP has figured this out before investing that massive in cloud-solutions and also in cloud-hosting. I don’t know that much about patching systems on an operational point of view, but I’m pretty sure there is a strategy available. Maybe someone can jump in and bring some more light to the dark spots here. Maybe (or also 😉 ) it is a gap at the application side and we need to have unit test/ecatt (automation of testing) improved and delivered with every application we are building, that the testing will get better and a lot faster. thanks for your comment and your questions. I’m with you that a certification update is not a bad thing. It is a fast moving technology and if you compare for example SPS7 with SPS10 => there are a ton of new tools and the way you install and update the components. But should it be a must have? For some people (e.g. freelancer) and companies it could be more a time issue than a financial impact. You should be well prepared for the exam. It consists of 80 (associate) + 40 (install) questions. You can visit a delta training or collect the details by yourself. However one week + the days for the exam are gone. If you have 5 DBA’s and everyone should administrate and install a HANA DB, you have a lot of off time for this people. Normally a trainings contingent of the company should absorb this, but you have to plan this every 18 months. For other DBs this was not a must have – consider this. – Upgrades without upgrades of the application-side doesn’t have a deep impact on the testing is my experience, so I wonder that you have such a hugh digit. => as Stefan already mentioned, if this are just fixes and no new features with adapting core functions e.g. delta merge algorythm, execution plans, set of commands inside HANA (=> this fits for the maintenance revisions) => you don’t have to do big regression tests. thanks for your reply. Nice to see a point of view I haven’t covered before. Testing the CDS could be an easy thing if there are unit-test available, so I believe it is a thing, which need to be covered together with the applicationside. The applicationside invest a littlebit more on having good automation of testing will take away this painpoint on your side. So (also a lovely phrase of consultants 😉 ) it is up to the customer to not see only the shorttime invest of such testing-solutions. Regarding to the certification I can understand your point of view. On the other hand there is the need to guarantee that we (all of us, developers, consultants, basis-guys and so on) are adapting the new possibilities and a lot is also working in an old fashioned way which might not be clear to the customer. So how would you cover the need, that new functions are used by the people which are responsible for the systems? At the moment I don’t see another way to get the features delivered without the certifications.